Improve accuracy and reduce data entry by eliminating the paper chain of custody. Schedule samples in Element LIMS, enter data in the field, and upload information directly back into Element LIMS. EnviroChain EA reduces cost and increases productivity through integration with Element LIMS (via the ClientConnect application) and by eliminating paper CoCs. EnviroChain EA (embedded application) is a web-based sample submission application that logs samples directly into Element LIMS. And with a bi-directional integration, Element LIMS project, work order, and schedule information is automatically accessible. Submitting samples with EnviroChain EA reduces paper, reduces transcription errors, and accelerates the process of submitting and managing samples, all at a fraction of the cost of managing paper CoCs. Samples, methods, containers, preservatives, sample locations, and other data is pre-populated for pre-logged samples scheduled for routine testing, or for samples previously submitted. To encourage your clients to use EnviroChain, consider offering your best negotiated price for testing when they agree to use EnviroChain EA for all their sample submissions. It improves convenience for them and offers both of you a cost savings opportunity. Automating and streamlining sample login gives you and your team more time to focus on analytical testing. Eliminating the paper chain of custody and data entry reduces operating costs. Pre-loaded information and mobile application eliminate transcription errors and confusion. EnviroChain EA features and functionality developed specifically for organizations that require environmental testing of soil, water, air, cannabis, and food. Enter data through any web-enabled device with internet connection. Copy existing sample submissions to save time. Use previous sample entries as a template for new entries. Build a custom CoC and store in Element LIMS library for access by EnviroChain EA. Assign the proper sample containers from within Element LIMS. View transaction history through the Element ClientConnect web portal. As soon as the samples are submitted, the information is available in Element LIMS. 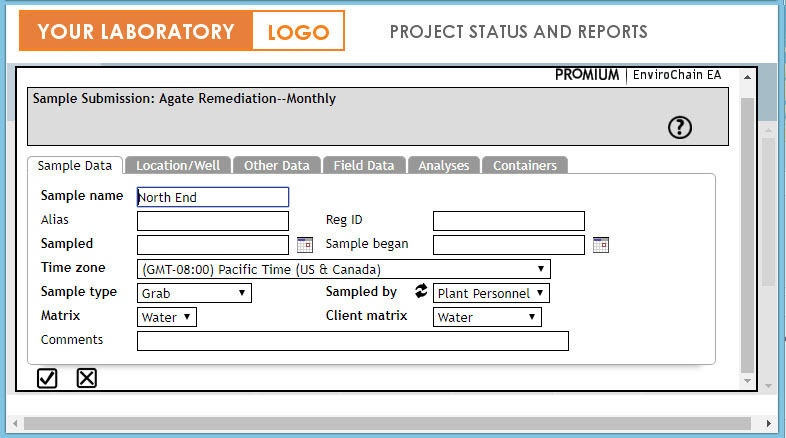 Register your laboratory in EnviroChain and set up your laboratory and user information. Select a key group of your clients to help launch the use of EnviroChain EA. Add information to your website and other marketing promoting the benefits of online sample submission to your clients (sample generators). Provide training to your clients as needed. After the trial, when you are ready to move forward, contact us and we will work with you to select the most appropriate plan for your needs. Get a live demonstration of EnviroChain EA. Annual and monthly subscription options to meet your needs. Print a custody seal to record CoC number and secure the samples. Learn more with FAQ, User Guides, videos, and Datasheets.